The Cheesecake Factory make all manor of flavoured desserts, which are all delicious. 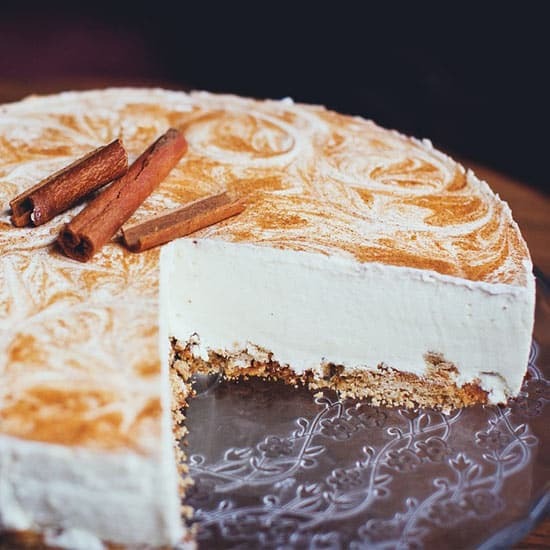 All of them have one thing in common, and that is that they originate from this recipe, the original recipe Cheesecake Factory Cheesecake. The most popular and most ordered cheesecake! Top Tip - This recipe serves as a perfect base for you to add your own flavoured topping, whether it is fruit, caramel or chocolate! PS. We always top ours with a serving of whipped cream! Start by preheating the oven to 245°C (475°F), and place a large round pan, with around 1/2 inch of water in, into the oven. This will be the water bath and the cheesecake pan needs to fit inside this. While the water is heating move onto making the crust. Crush the broken cracker chunks into fine crumbs. Combine the cracker crumbs, cinnamon and margarine and mix together. Next line a 9 inch pan with parchment or grease proof paper, and empty the crumb mixture into the bottom of the pan. Push the crust firmly to fill the bottom of the pan, and just over half of the way up the sides. Wrap the bottom of the pan with a piece of aluminium foil and put in the freezer. Next move onto the filling. Using an electric mixer, combine the cream cheese, vanilla, sugar and sour cream. Mix until you have a smooth and creamy texture. In a separate bowl whisk together all of the eggs, and then add to the cream cheese. Blend the mixture a little more until the eggs have combined with the mixture. Once your mixture is done, remove the crust from the freezer and fill your pan with the mixture. Carefully place the pan into your water bath in the over and bake for 11-12 minutes. After 12 minutes turn the oven down to 175°F (350°F) and continue to bake for 50-55 minutes, until the top of the cheesecake turns a nice golden colour. Remove the cake from the oven and serve onto a wire rack, and allow to cool. Finally combine the sour cream and sugar that you put aside for the topping. Once mixed spread the sour cream over the top of the cool cheesecake. Place in the fridge for 3-4 hours before serving.